Re: What's Brewing this Weekend? "Brewing" a cider later today. My first cider. Just 4 or 5 gallons of apple juice, yeast nutrient, and WLP028. Brewing a Lager 65%Pils 35% Munich. Tapped a 100% Waimea IPA. First time using that NZ hop. Mixed bag of juicy citrus. Grapefruit, orange and lime. 104ibu from 20-5min. Tastes and smells good, but weaker and a lot less bitter than the same beer made with C hops. Brewed a Saison with Blaugies yeast, EKG and Caliente hops. Glad Wyeast finally made this yeast available all year. Got a Belgian Dark Strong coming up on Friday. Working with Hoosier's tip on a WY 3787 and 1762 blend. Curious to see what you think, Rob. They're complementary. Just had to fermenter prime my Big Old Ale as I missed the spund completely. 1.103 OG down to 1.030 in under 3 days! WTF! Hoping to catch the BDSA in better fashion. Whoa, damn. That is quick for a beer that big. Speaks to your yeast (and overall) process. I'd have thought maybe spund at 5 days on that beer. Wow. Uhhhh, yeah. Me too. I was going to take the first hydrometer reading at day 5, but totally missed it! Only pitched about 200 mL of WY 1028 slurry (with a vitality starter) and 2 min of straight O2. The yeast ripped right through that wort like no one's business. I've got a saison planned for this weekend. I'm going to pitch a blend of 3711 and 3724. I'm going to try and brew a double 1/2 batch (2x 3 gallon batches) to fill some 2.5 gallon torpedo kegs. I'm thinking a big hoppy american red, but I'm falling short on the other. I'm just about out of dark beer, but maybe I'll try for a golden stout for funsies. Maybe a sahti though? If you have time, try 3711 and Dupont dregs. The dregs don't even need to be stepped up and you get to drink a bottle of Dupont which contains 3724 and more strains. The result is good. No stalls. 3724 flavor with 3711 dryness. Today I brewed an ESB, or technically a strong bitter. For half of the base malt I used a local malt, their version of an English pale malt, the rest Maris Otter -- plus crystal malts and torrified wheat. I think the stated pppg of the local malt is a little higher than the actual. At least in the batch I got. I don't normally come in 5 points low but did today - so have to place the blame somewhere! Target was 1.055 and got 1.050 so at least it stayed in the strong bitter range. Still, I think it will be very tasty! 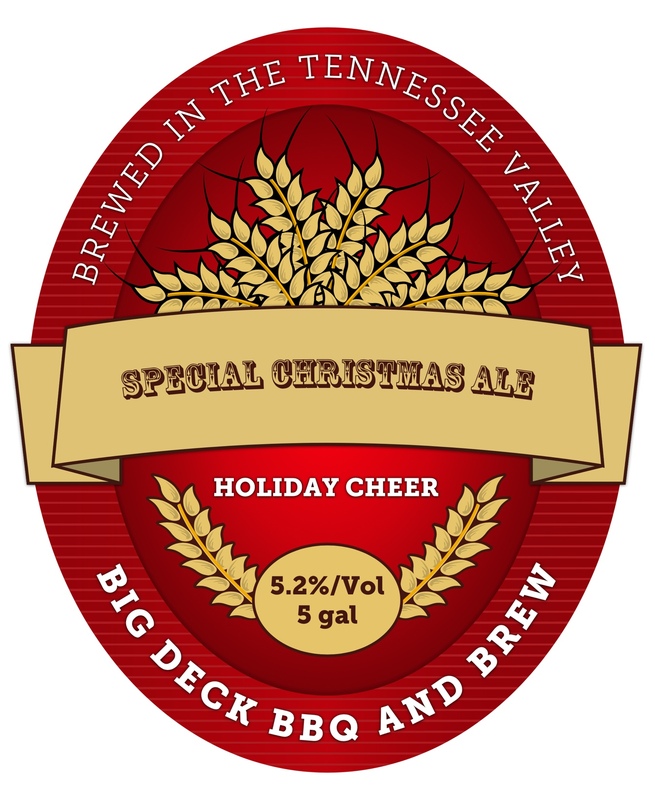 I am brewing my Christmas Ale today. All Vienna malt, Challenger and Hallertau hops, and Orange peel. Cheers! I have a Scottish Ale happily bubbling away in the basement--brewed it two days ago just as the Arctic cold blew into Western Massachusetts to conveniently bring the basement room where I ferment to below 60 degrees. This time, I "carmelized" some of the first runnings and also boiled for 90 minutes--and I noticed the wort was darker than last year, so I'm encouraged. Used Golden Promise, a bit of roasted barley (1.5 oz. ), and a pound of crystal 10--last year I relied only on carmelizing, and it was too light and dry. This time, I plan on throwing in some oak chips from my backyard oak trees to add some flavor. I pitched the 3724 since I had already purchased it, but that sounds like an interesting idea. It could also be fun to try growing up some dregs.